In a constantly “on,” uber-connected world where employees often feel pressure to be available 24/7, work-life balance is a commonly discussed workplace topic. There are many reasons to help your employees achieve a balance between their professional responsibilities and personal obligations, and while it’s certainly a must-have benefit for the coveted millennial generation, there are other advantages to offering this flexibility that will impact your business’ overall health, employee retention capabilities, and talent acquisition efforts. Recruitment and retention of top talent. Offering work-life balance will enable you to recruit from a larger candidate pool, especially the flexibility-minded Millennials and Gen Z, which combined will soon make up the majority of the workforce. Conversely, poor work-life balance leads to turnover, and it’s often cited as one of the key reasons why employees leave their current jobs. Greater employee satisfaction and engagement. Providing work-life balance engenders more loyal and motivated employees who will go above and beyond the call of duty, leading to greater performance, which can impact your bottom line. Healthier employees. Employees who maintain work-life balance are physically and mentally healthier and are more likely to be productive employees. Working long hours under stressful conditions can lead to burnout and an array of medical issues. Lower absenteeism and increased productivity. When employees are stressed, overwhelmed, or burned out, they may not come to the office or put in optimal effort. As a result, performance suffers. Employers who help their employees achieve work-life balance realize lower absenteeism rates and benefit from greater and higher quality output due to better physical and mental health. Recognition as an employer of choice. Businesses that support work-life balance create a positive employer brand, which enables them to improve their talent acquisition efforts, attract top performers, and maximize employee retention. 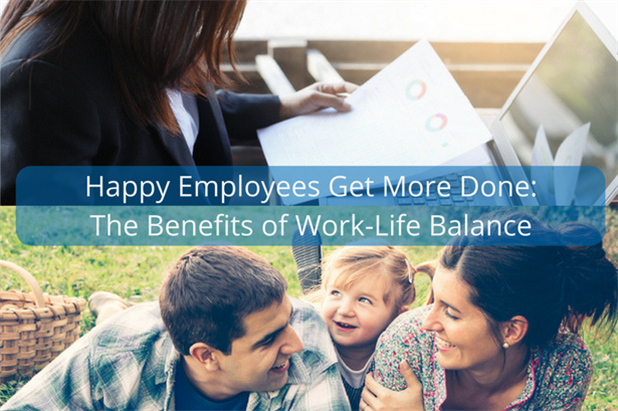 Now that we have established why you should help your employees achieve work-life balance, there are many different ways that you can accomplish this goal. Flexible schedule options. Rather than requiring your employees to work 8 to 5, give them flexibility to work a schedule that meets their needs. For example, some employees may prefer to work 7 to 3:30 or 10:30 to 7. Furthermore, if an employee has an appointment, they can adjust their hours without having to use their time off. There is little downside to employers who offer this option, aside from the need for a bit of schedule coordination to ensure appropriate coverage for clients (both internal and external). In fact, employers may find that they have greater coverage after implementing a flexible schedule policy. Compressed workweek. A compressed workweek allows employees to work all 40 hours in a shorter timeframe than the typical 5-day schedule. An example would be allowing your employees to work four 10-hour days and having three days off. A challenge for companies employing this option is that clients may expect service five days a week, so it’s important that they know who to go to on the day that a given employee is not in the office. Focus on results rather than time. The Results Only Work Environment (ROWE) is growing in popularity – ROWE is a management philosophy where employees work when and where they wish and are evaluated solely on results, not time. A key to success with ROWE is strong leadership that clearly communicates required outcomes; however, management isn’t easy, so things can go awry quickly. However, some types of work (such as brainstorming) yield better results when performed face to face. Telecommuting. Many companies allow their employees to work from home or telecommute, either on a full-time, part-time, or as-needed basis. Technology today makes this so easy, and it can save employees valuable travel time and the added stress of sitting in traffic. Furthermore, this separation can sometimes enable greater concentration. Some studies indicate that employees are more productive working from home due to these reasons. For employers, some managers may have difficulty with telecommuting if they believe that employees who are “working from home” are not staying on task. Like many of these options, a focus on results and high levels of trust are needed to ensure success. PTO. Many employers have abandoned separate vacation and sick leave banks in favor of a paid time off (PTO) bank. PTO affords employees greater flexibility to use their leave as they see fit to best manage personal needs that arise. Perhaps the greatest drawback to PTO is that it may encourage employees to come into the office sick, as they want to save their leave for enjoying a day off or vacation. Unlimited PTO. A step beyond PTO is unlimited PTO, which expands the number of leave days available to employees. While you must have a high-trust, performance-based work culture, this is a great recruitment and employee retention tool. And, while it may be counterintuitive, staff generally do not abuse it. Key benefits for employers include the simplification of administrative tasks and an overall cost reduction – there is no financial exposure/leave liability to capture on the books, and when an employee leaves the company, there is no accrued leave to pay out. While many employers are concerned about the possibility for abuse, the primary downside to offering unlimited PTO is that most often employees will use fewer days than if they had a definitive number of PTO days. And, this is bad for businesses. Employees need to use their leave to recharge their batteries and avoid burnout. Accordingly, in addition to ensuring the policy isn’t abused, companies offering unlimited PTO should encourage employees to use it. Paid paternity/maternity leave. In addition to being a hot topic on a national and regulatory level, many states are starting to mandate paid leave, especially for childbirth and baby-bonding purposes. While small businesses may be concerned about the cost of offering paid paternal leave, the long-term benefits of higher employee retention and productivity combined with improved talent acquisition capabilities make up for the added expense. Offer part-time jobs/job sharing. Offering part-time schedules is a great way to appeal to a wider talent pool, particularly those with children, aging parents, school commitments, or other obligations that make working full-time prohibitive. Boundaries and culture. A key to providing work-life balance to employees is creating a culture in which employees do not feel that they must be working all the time. Cultural cues, like unmanageable workloads, emailing employees in the evenings and weekends, managers not taking PTO, or frowning upon the use of flexible work schedules, will result in fearful employees who do not exercise these options. And, this can lead to mistrust, overwork, and higher turnover. Ensure that your leaders are promoting and modeling work-life balance, which will encourage your employees to do the same. Not every company will be able to offer all of these options; however, every company can do something! Start small, test out various programs, and see what works for you. Encouraging work-life balance within your company will benefit your employees, your organization, and your bottom line.